The biggest lesson came from little people ranging from 2 to 5 feet, not yet able to drive, vote, or drink legally. Ponder over that! Imagine a two-year-old working between 50 to 70 hours per week. Can you? Children as young as 2 years old work in the ferias in Quito, Ecuador. About 10 to 12 hours per day, they assist their parents selling items in street markets. Their work pays for their daily living necessities like food, water, and housing; a luxury that many people take for granted, including me. Twice a day, for a week, the UBECI team and I visited different markets in the South of Quito. The enthusiastic children anticipated our arrival. The children dragged their parents to our camp of toys, books, singing, and activities. They greeted each volunteer with a hug while they left their busy parents behind. And, the older children excitedly waited for us to help them with their homework. Inspiration emerged from the various opportunities and lessons that arose. I may have only spent one week with the children. 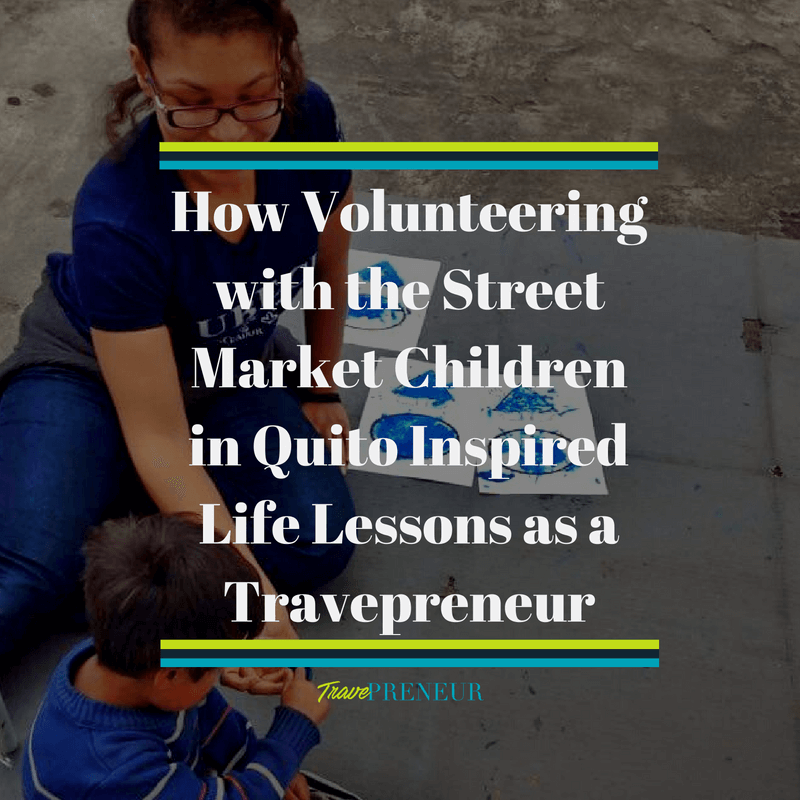 But, there are 8 ways volunteering with the street market children inspired the life lessons as a Travepreneur. My perception of the world draws on a new shade of color each time I travel abroad. 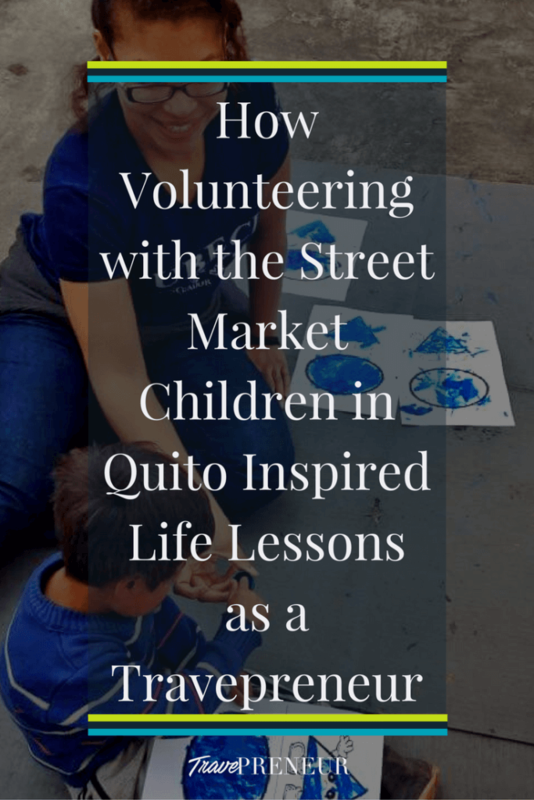 And, volunteering in Quito offered me a glance into the lives of more than 300 children who aren’t able to regularly attend school or participate in recreational activities. Instead, they work in a crowded, tight-spaced, busy environment, which isn’t conducive to their emotional or physical well-being. While the children may not know that their lifestyle isn’t considered ideal, they have an appreciation for the simple things in life. They looked forward to meeting and getting to know the familiar, and most times ever-changing faces of volunteers. Stepping into the volunteer role shifted my viewpoint. I was able to focus on the lifestyle and living conditions of the children and their families. It’s life. It is their lives. It’s the way they’ve learned to survive and hustle to protect and keep their family fed. We all work to survive, protect, eat, and sleep. But the way in which we do so varies by country, and that’s acceptable in my book. People tend to exhibit the hero complex -the idea that they are saving a country or group of individuals from themselves or circumstances. And, while heroes save people in distress, the story ends and everyone lives happily ever after. The children of Quito, however, live normal lives that take on an emotional, physical, and mental ride that last their lifetime. There is no swooping in for a week, month, or year and saving anyone. They continue to live as they always have even after a volunteer leaves. UBECI conducts programs specifically for the children of the markets. The program seeks to aid the children’s’ development, as well as offer educational tools to support their growth. As volunteers, we sat and read with them as they improved their reading skills and vocabulary. I, like so many others, wore that blue t-shirt branded with the company’s name and logo proudly. We represented learning, development, and fun. The world is big enough to share with others in which there are enough resources for everyone. But sometimes fairness eludes people. Individuals and families in countries like Ecuador resort to creating their own opportunities with the scarce income and tools that they have. Especially, when the norm is to employ everyone, including these children, to make money for the household. This is why I volunteer! As a citizen of the world, I have the responsibility to make contributions to communities that exhibit this unfairness. The community knows no boundaries. Truly, service is quite odd. The more I do for others, the better I feel. And, the opposite is true too. Traveling responsibly is an oath to be conscious of and respectful of the differences that we encounter. We learn new information which weakens those misconceptions and stereotypes about a particular place or people group. Ecuador has a distinctive culture. It is difficult to mistake the country and its people with any other in the world. Such error would be disrespectful to its cultural, economic, and environmental identity. Likewise with the other 192 UN countries that make up the world. Then, I began to learn more about traveling. Perhaps, it was because of the two to six-year old’s who were learning the color blue through a fingerpainting activity. Or, it was sitting at my homestay family’s dining room table discussing Ecuadorian culture and history. Travel is no longer a manner in which I see the world through shallow and careless eyes. 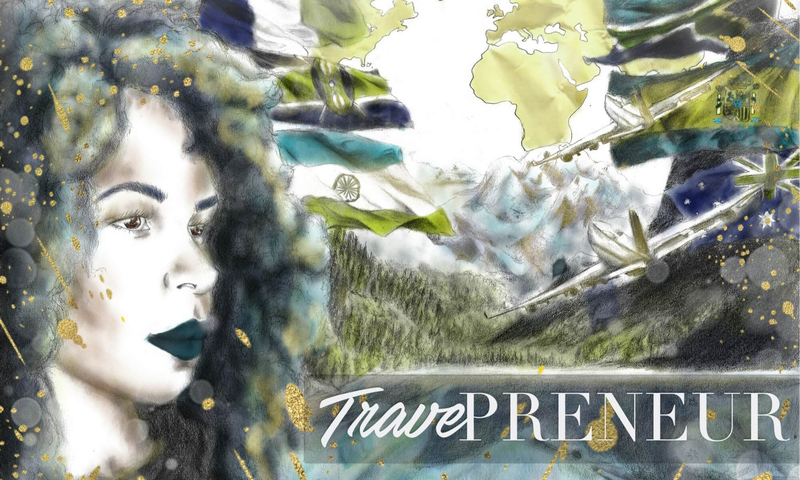 I travel for authentic experiences and to connect to each place I visit. Brian, Pablo, Adriana, Pata, and the other children attracted me to their home. There, I became a local instead of a tourist. Bright-eyed and bushy-tailed toddlers laughed and laughed. They did so from the moment they arrived at our camp to the moment volunteers walked them back to their parents. They jumped and ran in circles around each volunteer. They were without fear of falling, tripping, or becoming tired. This enthusiasm sparked my inner child to wake up and play. I jumped rope; something I hadn’t done since elementary school. I was 26 at the time, so you can imagine how funny that looked. I also painted. Rolled around on the pavement. Read children books. It was part of the day’s work. Volunteering isn’t always the easiest thing to do. Free labor is sometimes strenuous and tough. But, working with the children was a breeze because I was having fun. Drake has graciously given us a motto that even the children live by: “You Only Live Once.” And, that’s the purpose of life. To be present and accept what life has to offer without complaints and regrets. Whether it’s personal or professional, it’s the little things that are overlooked. But, volunteering with these wise, young souls, reminded me that I am still here on this earth for a reason. And, that reason could have simply been just to write this post. Volunteering in Ecuador definitely added value to my career trajectory and goals. Getting involved in the international arena helps me to define my goals. Making it easier to work in International Education as an Education Abroad Professional. Benefits, such as advising students and consulting with colleagues should come from more than secondary resources or articles. The hands-on experience, in this case, builds credibility and authority in the field. It may sound selfish, but the impact of volunteering in Ecuador helped me succeed in my career too. Acknowledgements: GoAbroad.com for awarding this opportunity to volunteer in Ecuador and Kaya Volunteer Travel for creating this program and organizing this volunteer opportunity. Share your stories of your service abroad! Comment below.